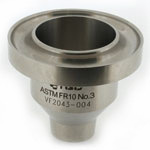 The TQC Viscosity Cup ASTM D1200 Ford is a range of titanium anodized aluminum or stainless steel viscosity cups with fixed stainless steel nozzle (inner cavity). the viscosity cups are suitable for laboratory use with a stand. Widly used for measuring paint, lacquers and other liquids. Klik tombol di bawah untuk menambahkan Ford Cup ke Daftar Keinginan Anda.